Is it possible that your city helps determine your health? One report, shared by Better Cities & Towns, says it’s not possible – it is happening. 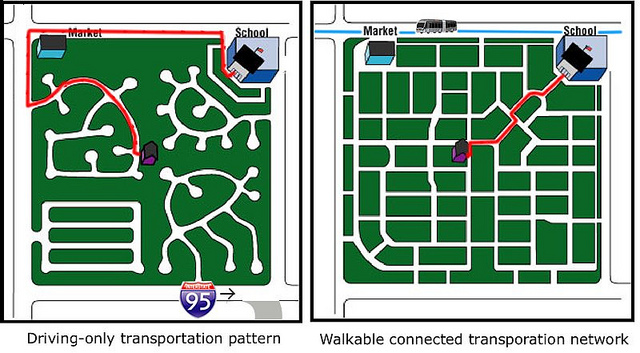 Connected communities that allow people to get from Point A to Point B without driving actually encourage walking and biking, therefore creating a healthier space. In particular, the research, which examines different aspects of compact, walkable, and mixed-use communities and compares those aspects to published government health data, finds that such neighborhoods and cities are strongly associated with reduced rates of obesity, high blood pressure, heart disease, and diabetes. The reason is close to a tautology: walkable environments encourage walking, which in turns facilitates good health. While researchers are careful to point out that many other factors facilitate good health as well, the results hold up even when the studies are controlled to eliminate those other factors from consideration.